The default Linux distribution is Raspbian. If you run a Raspberry Pi not as a desktop replacement, but rather as a server, then you have to do it on the command line with services, services and daemons. The word "daemon" derives from the "D" isk "a" nd "Execution" mon stor and refers to utilities that start at system startup or later and work in the background, so a daemon is a service or service. Services are controlled by special commands. There is also the option to start services automatically at system startup and to switch this functionality off again. There are also commands that give information about a service. For example, whether it is running or automatically started. Here we take as an example the service SSH (ssh), which usually runs and where you can try the different commands. Of course only if you are not logged in to Raspberry Pi via SSH. These commands have to be differentiated between Raspbian Wheezy and Raspbian Jessie. There was a change of the init system from "Sys-V-Init" to "systemd". The old commands of Raspbian Wheezy also usually work under Raspbian Jessie, but not the other way around. Under "systemd" you should already get used to the new commands. Start or disable services automatically at boot time (rcconf). NOTE: Stopping a service in the runlevels does not permanently remove a service. On the contrary, a service that is stopped but not removed is just waiting to be started. This can be done while updating the package. Or just a restart. To actually disable a service is to disable the service in the runlevels or to remove the corresponding package via apt-get remove. Raspbian Wheezy uses update-rc.d to enable and disable services in each runlevel. As a rule, services are automatically started during installation and entered in the correct runlevel. However, it may be that the service has been temporarily decommissioned and now wants to reactivate it. If you want to have a deactivated service automatically started at boot time, you can create the links to the start / stop script with the following command. Service should NOT start automatically in the future. The links to the start / stop script are deleted from the runlevels. 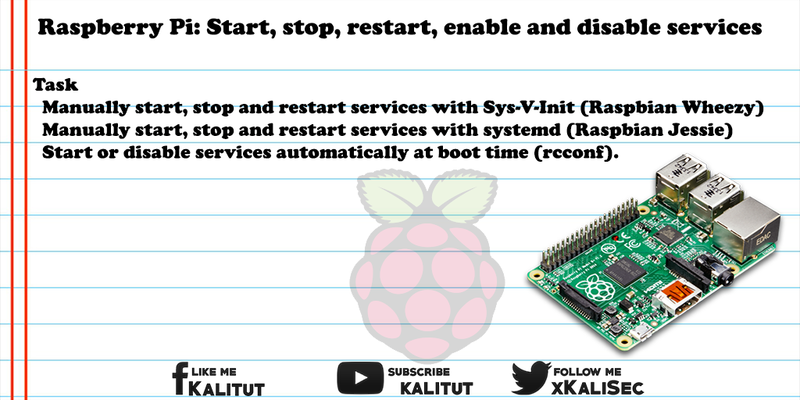 When changing from Raspbian Wheezy to Raspbian Jessie, there was a change of the init system from "Sys-V-Init" to "systemd". The old commands of Raspbian Wheezy also usually work under Raspbian Jessie, but not the other way around. Under "systemd" you should already get used to the new commands. Systemd units can end in .service, .socket, .target, .timer, .mount, .automount, .device or .path. If no unit type is appended, the default type is ".service". On a freshly installed Linux distribution, especially Raspbian, run not really useless services. So you should not shut down any services that later turn out to be important and only lead to the system being unusable. Before deactivating, you should be aware of exactly what the deactivation could have and whether it really makes sense. Using the example of the swap service, which can be easily removed and also restored, without putting a running system at risk, the removal of a service can be tracked.